Ever since I moved up to Newport Beach a few months ago, I have been biking nearly everywhere. When you don’t have a job, you have a lot more free time on your hands so you’re not in quite as much of a rush. A lot of people think riding your bike takes significantly more time than driving in a car, but once you’ve got a few weeks of riding under your belt, you can make surprisingly good time. You might show up to your destination a little sweaty, but you’ll save a ton on gas and you get great exercise while you’re at it. It’s also never a problem finding a parking spot on my bicycle! I actually ended up buying a few bikes off Craigslist over the past few months – one older road bike and two newer hybrid bikes. I didn’t like the road bike that much so I sold it(for a profit!) but kept the two hybrid bikes – a Raleigh Cadent FT0 and a Trek FX 7.2. I got a great deal on both hybrid bikes and paid about 40% of what they retail for. Both bikes were in good condition and rideable but they both didn’t shift very well. I didn’t know anything about bikes before I moved to Newport and during my initial research phase it took me a few weeks just to figure out what type of bike I even wanted. But once I learned all the basics, I was hooked. I loved riding and I figured it made sense to spend the money to get tune-ups for my bikes so that they would run smoother and go faster. At my local bike store, tune-ups ranged from $50-$150 depending on how much work you wanted to be done. I don’t think that price is that outrageous but considering that my bikes only cost $200, I didn’t want to spend 50% of that on a tune-up that I would need again in a year or two. Biking is just a hobby for me and I’ve always felt that the person doing the hobby is a lot more important than the equipment they use. I went to my favorite website – Craigslist – and I actually found a few guys who were willing to tune up my bicycle for me and teach me along the way for $50. The guy I ended up choosing seemed credible since he was on a professional cycling team, had been fixing up his own bikes for years, etc. But I did have to take some risk since he could have turned out to be some joker who knew nothing about bikes. I met up with him one afternoon and he taught me all about the basic tune-up techniques. I could tell he wasn’t a professional since a couple things stumped him and he couldn’t completely tighten my brakes and get the wheels spinning perfectly straight, but he did help me out a ton with the shifting. One of the big problems I was having on both of my bikes was the shifting. The shifters worked OK, but it wasn’t very smooth going from gear to gear, sometimes they would get stuck and other times they just wouldn’t go at all. My Craigslist teacher showed me how to clean and lube the chain in about 10 minutes and when I got on the bike afterwards, the shifting was flawless! I couldn’t believe how much of a difference it made. I bought four products off Amazon and I’ll be able to tune up my bikes and other people’s bikes for years to come. Here’s what I ended up buying. I don’t have a garage to work on my bike so I couldn’t get a heavy duty bike stand. Instead, I got a nice adjustable height bike stand that is very small and compact. I already tried it out and it works pretty well for how lightweight it is. It doesn’t clamp down like a normal bike stand and suspend your bike in the air but it does let you clean the chain and do other similar minor repairs with the back wheel a few inches off the ground. I didn’t have to buy this item but in order to clean the spaces in-between the rear cartridge, I cut up pieces of cardboard and slid them right in. They fit perfectly and they actually do a really good job of removing all the gunk and grease. You could do this before or after cleaning the chain but I like doing it before. This was the cleaning product that my Craigslist teacher used and it worked really well so that’s what I bought. There are hundreds of other ones that you could probably use just fine though. I like Simple Green Cleaner because you can use it all around your house and not just on your bike chain. I got a huge 1 gallon bottle(plus you will want to dilute it) for $16 on Amazon. I’d never seen this contraption before but it’s a really cool way to clean your chain without having to take it off. All you have to do is mix up some simple green with water to dilute it and then fill up the Finish Line Chain Cleaner . Attach the chain cleaner onto the chain and pedal backwards really fast for 30-60 seconds and you’ll see the liquid turn dark with grease. I cycled through about 5-6 times but that was only because my chain was so dirty. It helps to pedal backwards as fast as you can in order to really get the brushes and scrubbers cleaning. After you’re done cleaning, use a rag to dry the chain. Since I live in a dry climate, I bought a small can of Finish Line Dry Teflon Lube . Again, there are a lot of great chain lubes out there but this one seemed reasonably priced and had some of the best reviews on Amazon. Once the chain is dry, squirt some of the lube onto the chain and cycle through the gears a few times in order to spread out the lube. After you’re done, use a rag to dry the chain again and you’re all done. I went for a quick ride after this step, and my gears were changing flawlessly. If you notice some slipping in the weeks after a tune-up you can always spray a little lube on and see if that helps. Since I got my tune-up lesson, I went out and bought all four of the items mentioned above and gave my second bike a tune-up. It was a very easy process and took about 30 minutes. Eventually, I think I could probably do both bikes at the same time in about 30 minutes. I know there are a lot of other things you can do tune-up wise but I couldn’t believe how much of an impact just cleaning the chain had. It was so easy and it made such a difference. In the end, I spent about $60 on all the parts and equipment. I’ll probably never run out of cleaner, the chain cleaner contraption should be good for years and the lube will probably last a year or two – but it’s only $8 for a new bottle. Bikes can literally last a lifetime if you take great care of them and this is one of the most cost-effective ways to do so. If you have tire mis-alignment or other major problems, you’ll probably need to take it in for a full tune-up but cleaning your chain every few months to a year depending on how much you ride can have a huge impact on performance and the life of your chain. Readers, did you ever try and clean your chain yourself? Did you know about these products that can make cleaning your chain a breeze? Harry, thanks for the post. I’m a big fan of biking and learning how to take care of your bike. I like the cardboard tip…hadn’t heard that one yet, even though I have a rear cassette cleaning tool. 2) Check out local bike shops — they often have “repair nights”; in SF, Sports Basement hosts multiple with varying degrees of knowledge (beginner, intermediate, advanced). Curious (and semi-off topic) — what do you do with the old dirty cleaning liquid after running your chain through that device? I’m struggling on where to take that stuff to dispose of it because while the pre-cleaning green cleaner stuff is probably safe to put down your toilet, I’m guessing the post-cleaning version of the liquid now has grease, oil, etc. that shouldn’t be disposed of that way. Can’t seem to find a good resource on it though. Yea I liked the cardboard tip b/c it works really well and it’s free! But you’re right, a lot of what I learned and talked about in this article you can find on YouTube. I just wanted to let everyone know that it actually does work – I was amazed how much better my bike rode after cleaning the chain. I was hoping to learn a few more advanced tricks from the guy I got a lesson from but oh well. I did find him on CL and only paid him $50 haha. As for the dirty liquid, I put a rag underneath and just threw it away after but quite a bit does spill and go into the gutter. I live in an apartment so I did it in the street, looking back probably not the best idea. But I did take the remaining liquid and dump it out in the dirt and then washed it out with the outdoor hose. I think that might be the best way to dispose of it. Don’t think that stuff is toxic, but probably better to let it get absorbed by the ground than the ocean?? Open to better suggestions though. I ride an old Specialized Stumpjumper Team mountain bike that cost $1k back in 1986, my wife rides a Specialized multi-use bike, and our son rides a Specialized Hardrock mountain bike. I have done all maintenance on all bikes. Keeping the chains clean and lubed is very important, not only for ease of shifting, but for less friction while pedaling and longer chain and sprocket life. Truing wheels is also important. True means the rim does not have any warps or bends, and is perfectly circular relative to the hub. You should never ride with loose spokes, and bikes with rim brakes should not be ridden with wheels that are not true. Due to chronic health problems, I need to get my mountain bike converted from a mountain bike into more of a cruiser. This will entail changing the handlebars for a more upright seating position and then running all-new cables to the brakes and shifters. It’s pretty simple, but I may just take it into the shop for this conversion work since they have the right tools for customizing cables. I wasn’t even born in 1986! But that’s awesome that your bike is still running well after all these years, I guess that’s a tribute to what preventative maintenance can do. My ‘teacher’ showed me how to true the wheels but I could tell he didn’t quite know what he was doing. I’ll probably watch a couple YouTube videos on that since my wheels definitely need it. Yea even though I’m a big do it yourselfer there are certain more advanced things that I wouldn’t want to do myself. The pros will probably do a much better job and in way less time. I think it’s valuable to learn how to clean the chain and true the wheels though since those are things you can do all the time and they’re relatively easy. 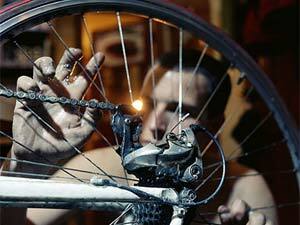 Bike shops charge $50-$100 for a basic tune-up like that. On a side note, I bought two hybrid bikes but I’m thinking of selling one so that I can get a nice used MTB($500 or less) – any suggestions? I like going for speed, but MTB’ing is such a better workout and the trails vary so much compared to street/trail riding. Hi Harry, I don’t have any suggestions for a good current mountain bike under $500. You might be able to tell from what everyone in my family rides that I like Specialized bikes. They have several mountain bike models in the price range you are looking at. I’d probably read a few online reviews. The other thing is to see what nearby bike shops carry. It would be a bummer to buy a Specialized, Trek, or whatever brand bike and then find that the nearest dealer is quite a ways away. mineral spirits to clean and I use chainsaw oil. wax also works well if you are in a dry climate. All are better and cheaper than bike branded stuff. I buy the same products for my bike, they work great. I never had anyone show me how to tune my bike, I just spent some time watching videos on youtube and was able to figure out most everything I needed to know. Yea like I mentioned above to Blake, I was hoping I’d learn some new techniques(other than what’s on YouTube) but I didn’t really. Either way, paying for the lesson did prove that those products actually worked and I wouldn’t be wasting my time and/or money.